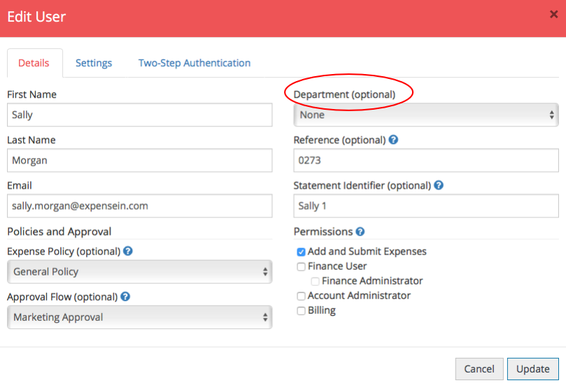 You can add departments to your account in the Admin section. Departments can be added individually or you have the option to import your departments. 1. From the Admin section, click Departments. 2. Click the New Department button. 3. Give the department a name. 4. The Reference field (optional) is where you can input the department reference to match with your accounting package. 5. 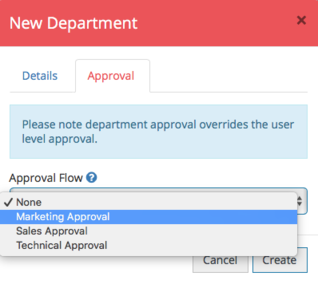 On the Approval tab, you can assign an approval flow to your department. This will mean that any users assigned to this department will be applied to this approval flow. If you haven't yet created your approval flows, you will have to do this first. Once you're happy, click Create to add that department to your account! 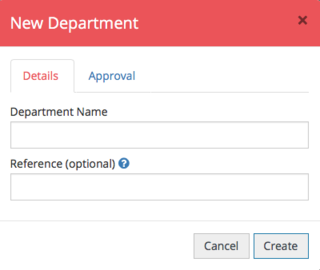 Now that you have created your departments you will need to assign them to your users. 1. In Admin, navigate to Users. 2. Choose the users that belong to the department you are assigning by selecting them (tick the box next to their name). 3. Click the Actions dropdown and select Change Department. 4. Select the department you wish to assign from the dropdown list. Alternatively, you can individually click Edit next to your users' profiles and select the department there. Users are able to override their departments when creating an expense. However, this function is only available if you have applied this setting in your users' profiles.